You are here: Home » What’s in a Name? Do you really know where your food comes from? Why is it intentionally made difficult to find out? This is one of those investigative stories that started out with a fairly simple task that ended up taking me on a journey to discover just how difficult it is to actually find out not only what is in some of the foods we eat, but where it comes from. I was asked by Mick Raven of ConspiracyOz, a colleague of mine from our ever growing independent alternative media network, to do some digging regarding some spinach (pun intended). Nature’s Nutrients Frozen Chopped Spinach to be exact. 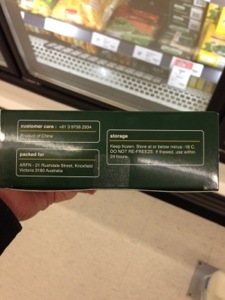 On a recent shopping expedition my vegetarian friend’s partner purchased the frozen spinach without checking the label. How many of you read the labels on the food you’re purchasing? Hopefully most of you reading this actually do. Upon returning home Mick diligently checked the label to reveal it was a Chinese import. Big deal you might say as what doesn’t com from China these days? You can thank the Lima Declaration for that by the way. Surely there are farmers in Australia producing spinach. 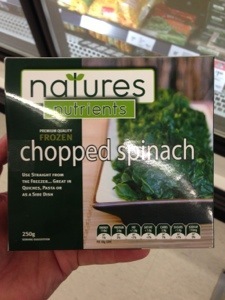 How hard can it be for a frozen food supplier to buy Australian grown spinach and on sell it to a Supermarket chain? Anyway upon reading the label (pictured below) you will notice there are limited details regarding the company responsible. Seems fairly straight forward right? Well try typing ARFN into a search engine. I was 6 pages through before giving up. Next try the address. Again a dead end. Try the phone number (in this format 03 9756 2934) and you get a hit on the first page with the company name. It turns out ARFN is a division of ENTYCE FOODS. So now we have a different address than what’s on the box of frozen spinach as well as another company. If you go onto Google Maps for that address you’ll see that Henderson Rd intersects with Rushdale St (the one on the box). Now go to Google Street View and see if you can find either ARFN or ENTYCE FOODS. I’ll save you the trouble if you like. You can’t see either of those at either of those addresses. You can however see a company called PFD Food Services. I contacted the General Manager of PFD Food Services and found out that Entyce Foods is a joint venture with PFD Food Services. So now we have another company involved. Perhaps that could’ve just been printed on the box or a simple website set up to direct people in the right direction? Nope,that would be too easy. Are you beginning to wonder why anyone would go to so much trouble to bring you Frozen Chopped Spinach from China? After Mick emailed me an initial photo I decided to go to my nearest Coles Supermarket to see it for myself. Turns out you have a choice of Spinach from another provider (who imports theirs from Belgium of all places) or the lovely sounding Natures Nutrients Frozen Chopped Spinach from whoknowswhere province in China. After taking a few photos of the box of spinach above I decided to randomly pick three items off the shelf that were Coles brand specific and check the labels. 2 out of the 3 were made in Australia from local and imported ingredients and the other was made in New Zealand from local and imported ingredients. That key word “Imported“. It occurred to me that I had no idea just what exactly in these products is the local and what is the imported ingredients or the country of origin for that matter. Labelling laws don’t require them to state specifically what comes from where. It’s that old “out of sight, out of mind” analogy. Knowing the country of origin and making your purchase based on this information is a strategy carried out by many shoppers. Who doesn’t prefer buying goods from Australia to support our economy? I decided to take it upon myself to contact Coles and find out the specific country of origin for these imported ingredients. Can’t be that hard right? Send an email, fill out a web form, call them even? Surely I could do either of these to get a straight answer. Well so far I’ve done all 3. Several times. They’re drip feeding me information in what appears to be an attempt at avoiding answering my inquiries. My question to them was: “Which of the ingredients in the following products are local and which are imported? Of the imported ingredients please inform me as to their country of origin”. Straight forward enough right? Well so far they have emailed me most of the information I asked for. They have omitted almost all of the information regarding their Cheese Supreme Corn Chips. Apparently according to them they have only two ingredients. Corn & Vegetable. That’s it! Not even Vegetable Oil. Just Vegetable. No mention of the whole host of other ingredients including the flavourings etc… I was surprised to see that among the ingredients for the Coles Choc Chip Cookies that the Rapeseed (Canola) oil is sourced from both Australia and the USA. Canola is a made-up word which stands for “Canadian oil low acid”, and is a genetically modified product. It is a Canadian invention that is backed by the government. It’s a cheap product to manufacture, and many processed or packaged foods contain canola oil. Canola oil was first bred in the early 1970′s as a natural oil, but in 1995 Monsanto created a genetically modified version of canola oil. By 2009, 90% of the Canadian crop was genetically engineered and as of 2005, 87% of canola grown in the United States was genetically modified. This is of course not on the label either. Without knowing where the food comes from how are we to know the quality? That is precisely the point. We’re not meant to know. Because an informed public is a dangerous foe. ← In the Eyes of the Oligarchs, Competition is Sin. Not all textured vegetable protein is made from soy, but a great deal of it is. Lecithin can be made from soy, eggs, sunflower or corn. Be sure to contact the manufacturer to find out which is in your product if the label doesn’t reveal this information. Enjoyed your chat with Mick on Conspiracyoz podcast, General. Just goes to show the length some operators will go to in order to obscure the origin of their products. The good lady and I go to a lot of effort to make sure we know the origin of our food, to the extent that the producers are telling the truth on their labels! It’s actually not that hard once you know what to look for, and we make sure we buy as much Australian-owned and grown as possible. Due diligence on behalf of us as customers is a must (I hate referring to us as consumers). It’s on us to make sure we buy right. But I gotta say, it’s not getting any easier mate. out how too begin. Any recommendations or hints?